These guys look like little geckos to me, cheeky beasts with sticky little toe pads. 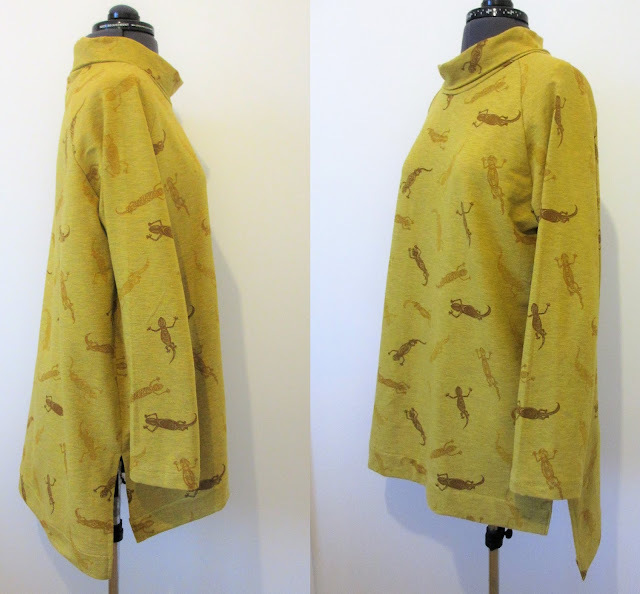 This wonderful french terry was found in Anglia Fashion Fabrics when we had a 'fabric lock-in' last year with Norwich Sewcials. 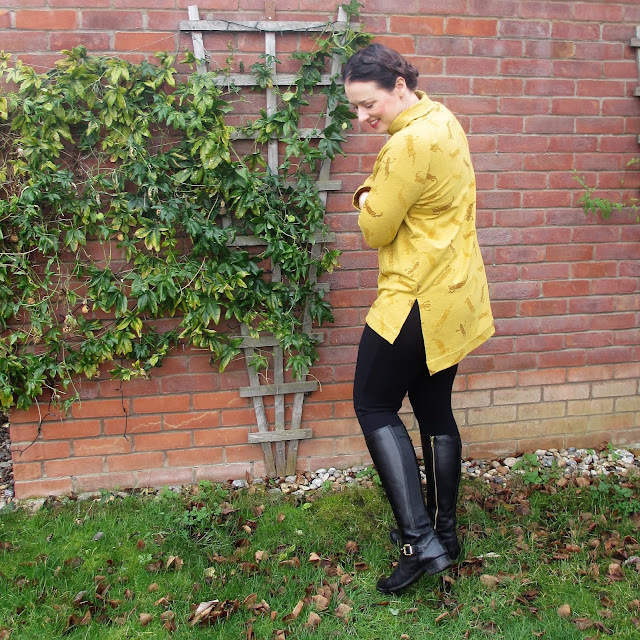 I love a bit of yellow and love a bit of reptile, so I was fairly easily persuaded to part with my cash when this was pointed out to me. This pattern is the Elliott Sweater by Helen's Closet. It's been doing the rounds on the interwebs for a while now but I only just got round to sewing it up. It's a time traveler top - cut out in 2018, sewn up in 2019. I tend to find that roll-necks bother me a bit and irritate my neck however in an attempt to step into a different style I did try this one. 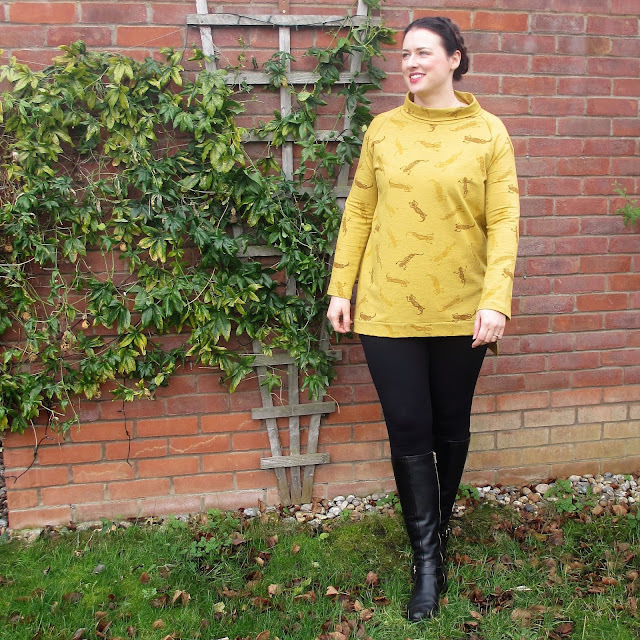 It's a great neckline as its actually quick wide and I cant even feel it on my neck, although its lovely and cosy. Admittedly this is the 'half neck option' - the 'tall neck' was a bit extreme for me and I probably would have just had my nose poking out of the top. I love the step hem and the long length which gives coverage where needed. It was a beautifully simple top to sew up and took under an hour to complete (after cutting). I'm surprised at how effective it is and how much I like wearing it. Since the cold weather started I've worn it absolutely loads as you can layer a good size t-shirt under there aswell without it being seen. Amazing! I love the colour and I love the lizards. So snuggly! The color looks like it would help keep you warm, too. I'm glad you mentioned the similarities between the Elliott and the Toaster - it seems like this silhouette is everywhere in independent designers' collections this year.